When it comes to reaching our best health and wellness, we already know the importance of clean eating and getting in daily movement. Some of us take it a step further to choose local and organic produce, over the conventionally raised stuff - and lastly we may put forth an effort to decrease household waste, save energy and even switch to natural personal care and cleaning products. Is there a step that i’m still missing? Some of you may be thinking of macronutrients (carbs, fats and protein), as being your essential nutrients. My real nutrition geeks are likely envisioning phytonutrients and omega fatty acids. But our missing link to best health is one thing that is even more essential than the nutrients coming from food. Rather - this was almost a trick question - because the step we are missing to level-up on our health journey is WATER. While water is not considered as being an 'adequate source of nutrients', since being energy-free in the terms of calories. But your body's need for H20 is actually higher than its need for food. Your body can survive for over one-month without food, but only a mere 3-5 days without water. It’s probably also good for you to know that your body is comprised of over 70% water, this is going to help us better understand why hydration should not be taken lightly. Of your total body weight, between 40 and 60 lbs is coming from your ‘inner ocean’. Now, how many of us are feeling the flowing ocean vibes and how many feel like a struggling stream in a hot summer draught. Even just talking about water tends to trigger your thirst, because your intuitive self knows just how essential hydration is. Thank me later. Drink up! Water is a major constituent in your blood, supporting the transport of oxygen, nutrients, electrolytes and hormones. It’s also a player in system detoxification - water is imperative for keeping things moving while also flushing out toxins and waste. Despite the human bodies ever-growing need for water, you'd think we would function more like a camel. Instead, many of us silently struggle to maintain a healthy hydration level, as a significant amount of water is lost each day. In order for your body to function, you need at least 8-12 cups (2-3 litres) each day - and this is just for basic function - if you’re exercising, are looking to improve your health and support healthy detoxification - you’re going to need much, much more. But water is for more than just drinking to keep you hydrated and functioning, you’re also using it to cook and clean yourself and your house with. So drinking water is essential, but i’ve got a question. How ‘Clean’ Is Your Water? does not mean tap water should be considered as ‘clean’. (Don’t worry, I will expand on this). What about bottled water? More sad news: brands like Nestle (Pure Life), Pepsi (Aquafina), Coca Cola (Dasani/SmartWater) and Fiji do not really care about your health or hydration level, they’re just profiting off the fact that humans need water to survive. I should also mention that 25% of bottled water is really just tap water in a bottle, sometimes further treated, sometimes not. Much of the water that corporations sell is obtained from public water sources for next to nothing. In Canada, many provinces now require bottlers to obtain permits to extract this water, but they charge very little for the privilege (in some cases, a corporation can pay just $3.71 for every million litres). Until recently, British Columbia did not regulate the use of industrial groundwater and they allowed Nestlé to extract millions of litres a year from a well in Hope, British Columbia - for free . Should I Be Drinking Tap Water Then? Well, you shouldn't be paying a ridiculous markup for a bottle of tap water that further explodes the pockets of mega corporations, while they steal water from our planet for next to nothing. Bottled water is definitely worse than tap water when you add the pollution factor to the equation… Globally humans buy a million plastic bottles per minute, and of this - 91% is not properly recycled . So what? Should I be filling a reusable bottle with that ‘clean’ water that comes from the tap, if it’s better than bottled? There’s that ‘clean’ word again. Although our water undergoes an essential disinfection process to destroy most harmful organisms like bacteria and parasites - chlorination of our water supply won’t eliminate all the bad guys (in fact, chlorine is even doing more harm by also killing the good microbes in your gut. Disease-carrying germs can still pollute our tap water, which can be caused from the stool of infected animals or people. Homes built in the 70’s are also commonly equipped with lead and copper pipes, and with corrosion - unwanted lead and copper can also join the bad guy party with the harmful microbes in your tap water. Heavy metals, nitrates, prescription medications, hormones, chemical fertilizers, pesticide runoff, arsenic and fluoride are also present in our ‘clean’ water. Because your tap water is dirtier than it looks. #1 Chlorine is harming your microbiome! Chlorine is the main method of action for disinfecting our water supply to kill disease-causing pathogens, such as bacteria, viruses, and protozoan. But you know what, the chlorine is also disinfecting your body and killing off the good microbes in your gut . If you’ve taken part in my Guide to Better Digestion program, you will learn just how essential water filtration is if you’re looking to heal and repair your gut! The Environmental Working Group has identified 316 chemicals in Americas tap water, 202 of which are not regulated. Let’s be real here, the only “chemicals” you really need in your water are hydrogen and oxygen to make H2O! Proper water filtration systems can remove heavy metals, nitrates, prescription medications, hormones, chemical fertilizers, pesticide runoff and arsenic. How can your water really be ‘clean’ with all that inside? The form of fluoride in our water supply, in your toothpaste and at the dentist is not the same natural fluoride that our bodies require (in extremely trace amounts, by the way). We are ingesting fluoride compounds from many sources at a level that are truly not safe for consumption  (NOT nutritionist approved!). Studies are now showing serious harm with even minuscule amounts of fluoride intake. Fluoride intake is being linked to brain damage and decreased IQ , lowered thyroid function , genetic damage and cell death , disruption of the synthesis of collagen , immune system dysfunction  and many other damaging health effects! If fluoride is in your water supply - ensure you choose a system that has the proper filtration to effectively remove fluoride. Daily water requirements for a family of four (8 glasses/64 ounces) equates to 7.5 lites. If your water comes from a 12-ounce plastic bottle, you are approximately paying $6 per case of water (fancy water can be much more), at around $0.40 per bottle you’re looking at an annual cost of $3,114.67. Pharmaceutical Drug Contaminants: Acetaminophen, Caffeine, Bisphenol A, Progesterone, Ibuprofen,Naproxen Sodium, Triclosan, etc. Also removes/reduces: Arsenic, Manganese, Nitrites, PCB’s, Petroleum Products, Selenium, Rust, Foul Tastes and Odors. While Berkey has a higher upfront cost than less effective filtration options such as Brita (which removes almost nothing), the Berkey is lower maintenance than pitcher models! 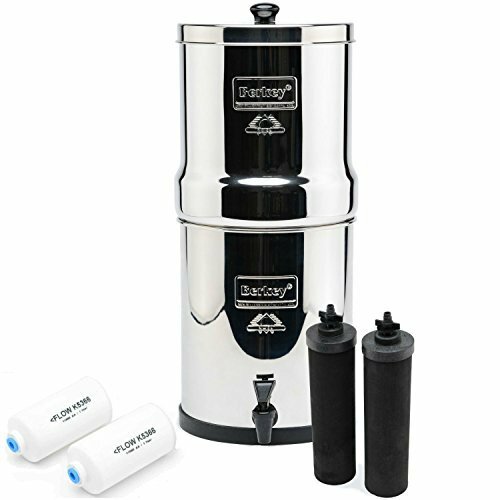 Each Berkey filter element has a life of 3,000 gallons (>11,400 litres). For a family of four drinking the recommended 7.5 litres per day (8 cups per person), you would need to replace the filter every 4 years at the cost of $100 to $120 CAD (price for 2 filters). Compare that to buying over 18 filters a year for your Brita! This product listed above includes the unit and four filters (including fluoride removal). Your total start up cost (and cost for one year) with this option would be $361.71. Compare that to the price of water bottles - your total savings for one year of drinking water would be $2,752.96. Not to mention, if you give up the plastic water bottles, you are decreasing your annual household waste by 4,380 plastic bottles. When you take a hot shower or bath, not only are you absorbing chlorine through your skin, but you’re also inhaling it! Researchers have found an increase in chloroform breath concentration of 6-21 micrograms/m3 after a just a 10-minute shower. Since warm water also further opens your pores, a combination of what your skin absorbs and what you inhale during a 10-minute hot shower is more chlorine than what’s found in the recommended eight glasses of water . #2 YOU’RE BUYING ORGANIC, BUT USING TAP WATER FOR COOKING? In addition to negatively affecting your health, cooking with unfiltered tap water can change the taste of everything that you prepare in the kitchen! If you’re spending money on organic, but washing your fruits and vegetables with tap water that contains pesticides and herbicides - this may be slightly counterproductive. Looking for softer, brighter and longer lasting clothes? With a whole house water filter, you’re removing the chlorine and other chemicals from the water as it enters your house. That means none of these are being used in the washing machine! Less chemicals being embedded in your clothing can work to increase the lifespan while adding more vibrancy favourite textiles! Even if you have a filtration system - you’re probably still going to be using the tap for a glass here and there, and for your cooking, coffee and tea making. Not only will a home filtration system drastically reduce any plastic waste, but you can confidently and conveniently use the water straight from your tap. It’s first nature to turn on the tap on for water - make sure that water is clean and filtered! The Benz, Tesla and Maserati of water filtration (I know nutrition, not cars! ), a RO system hooks up to the plumbing in your house so that you will have filtered water coming straight out of whatever tap you hook the system up to! A reverse osmosis system uses a process that reverses the flow of water in the natural process of osmosis, the water will pass from a more concentrated solution to a more dilute solution through a semipermeable membrane. Reverse osmosis filters are definitely pricier, but they last for years, and are relatively easy to install, even if you’re not a professional plumber. If this is the option for you, have a chat with the staff at your local hardware or home improvement store as they will be able to advise you on all your options. One final step to keep in mind is that while filtration/purification systems are effective at removing everything that you don’t want in your water, they also remove some things that you do want - this being beneficial minerals; like calcium and magnesium. If you’re an avid holisticole blog reader, may have already heard me boast about Concentrace before... This trace mineral supplement is one of my top recommendations. Super-concentrated with over 72 essential and trace minerals. Just simply add a few drops to your reusable water bottle (with your filtered water) or cooking - to ensure you are not missing out! Electrolyte replacement: increased energy and vitality by balancing soluble minerals in the body fluids. Circulatory health - minerals play a vital role in decalcification, antioxidant support and cleansing! Is fluoridated drinking water associated with a higher prevalence of hypothyroidism? Effect of fluoride on collagen synthesis in the rat. Chloroform exposure and the health risk associated with multiple uses of chlorinated tap water.